You are at:Home»Plastic free around the world»Plastic-Free Tuesday posters! And 10 tips how to spread them. We cannot only rely on the world wide web to create awareness about the Plastic Problem and inspire people to change behavior. We need to get the message out at places where plastic waste originates: On the streets, markets, and in stores. That’s why we have designed posters to be used in the real world. I hereby proudly present our first batch of posters and share 10 tips how to spread them and get the most out of them. 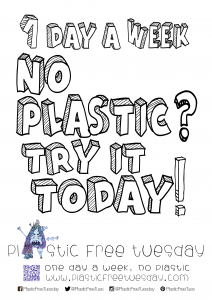 Let’s make Plastic-Free Tuesday a global movement! Because Plastic-Free Tuesday is a global campaign, we are developing posters in multiple languages. Today we launch our English and Dutch editions. More editions will follow. A Chinese edition is in the pipeline…! We would love to receive YOUR input regarding text in your language. It doesn’t need to be a translation of the English or Dutch editions. Most important is that it fits local culture and habits, and that the posters really get people thinking about their plastic consumption. So… here they are! Click on the poster to download. The posters are great in A3 and A4 size. 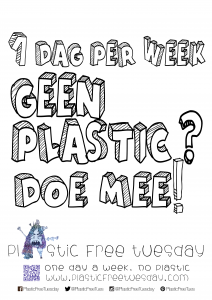 For those of you who don’t understand Dutch, the literal translation is “One day per week no plastic? Join us!”. 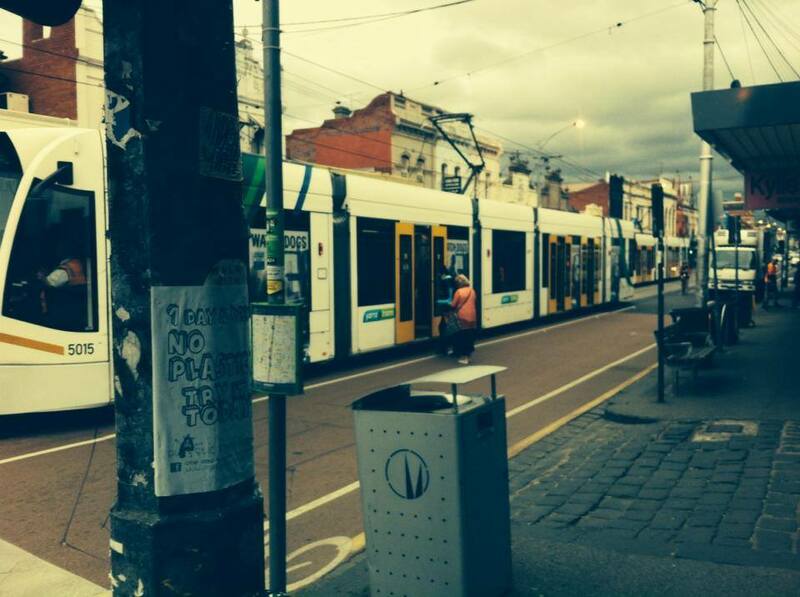 I have already gone around in my neighborhood in Melbourne posting up these. Using plastic to promote plastic-free living would be a pretty peculiar paradox… See 2 for an awesome alternative. It takes only 3 ingredients found in every kitchen to make your own eco-friendly glue. Mix ½ flour with ½ water. Add a spoon of sugar for a super sticky suspension. Cover the spot before putting the poster on top. Give an surface and voilà! Different laws apply for different countries. Sometimes you have to be a bit of rebel to get your message out there. The general rule is to be respectful towards private properties. For some reason people riding bikes seem to have a lotta love for Mother Earth. Poles and trees along bike tracks are therefore a supreme paste-up spot! The red light forces people for a break of the daily hectic. Give them some inspiring footage while their waiting for the green light. A classic method used in classrooms. 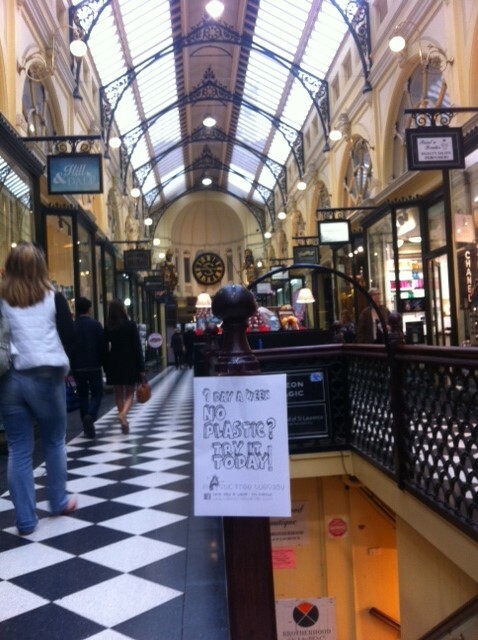 Create a trail of posters along food paths to get the attention of passengers. A Monday night or early Tuesday morning are the best times. To avoid trouble, go after dark or before dust. Media is powerful. Put your posters up around radio and TV stations to get the attention of producers and presenters. 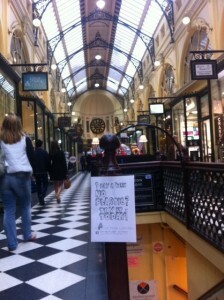 Big chance they mention your paste up in their show. Gray concrete landscapes will cheer up with some posters. 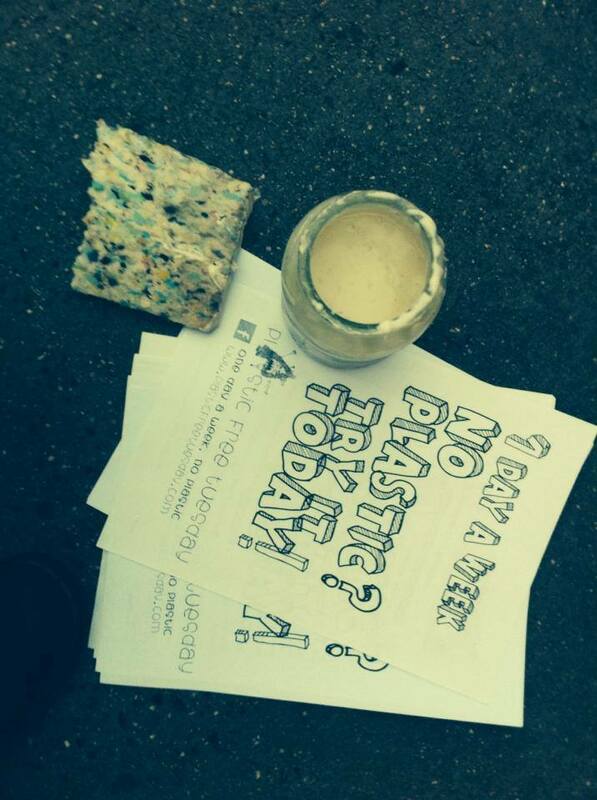 It takes some courage to be a Plastic Free Tuesday pioneer in public. Don’t let critical eyes or weird faces put you down. Paste your posters up with pride cause your working fort heir better future. Please help spread Plastic-Free Tuesday to all corners of the planet. You can download the posters here. We would love to hear from you (and see pictures!) if you use the posters. 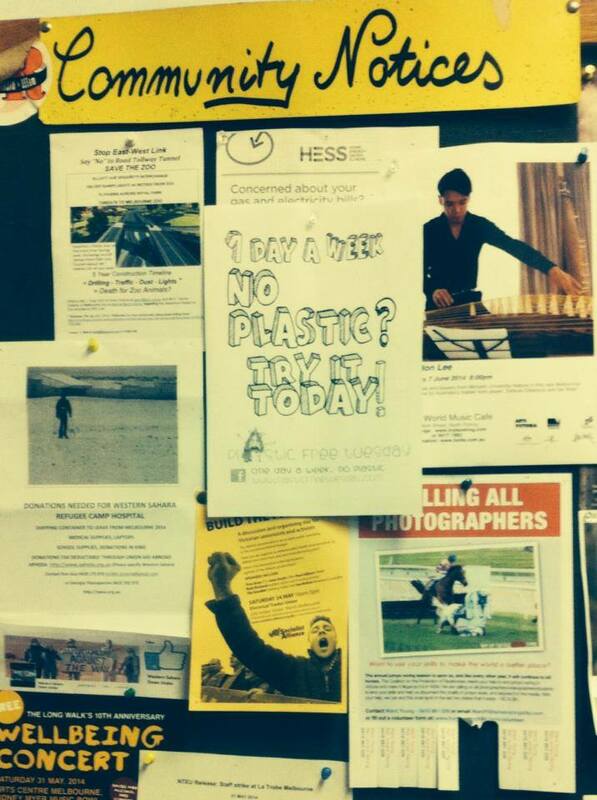 Leave a comment or share your poster experience on social media, using #PlasticFreeTuesday. A great initiative, THANKS! …… I’m busy printing a few (10) posters as a starter to post around this lovely -but unfortunate plastic littered- university town in Germany…. Fantastic Rien! Thank you so much for your support! We really appreciate that. We are currently working on a German edition. This one will be available for download within a few days. Thanks for spreading the message! Great work Gerda!! You’re the best! And for another tip for plastic-free posting I just realized: metal pins on pin boards! I just put up two posters around the office with that. May work for supermarkets as well. (evidence via Instagram). I think another great place to put them up is at coffee machines where people get plastic cups..